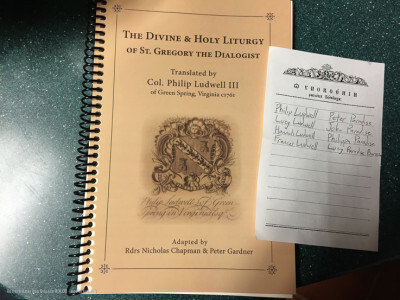 In 1760 Colonel Philip Ludwell III began a handwritten book that included the first complete English translation from Greek of one of the three principal liturgies of the Eastern Orthodox Church. Entitled “The Divine and Holy Liturgy of St Gregory the Dialogist,” it is more commonly referred to as “The Liturgy of the Presanctified Gifts.” The Liturgy is a liturgical service for the distribution of the Holy Gifts on the weekdays of Great Lent, and was first documented by St. Gregory the Dialogist (St Gregory the Great – AD 540-604), who was the papal legate to Constantinople prior to becoming Pope of Rome. At the time he made this translation Ludwell was living in London, England with his three daughters, Hannah, Frances, and Lucy. It is thought he completed the work in June 1761 and that the text may have been used at a celebration of this liturgy following the reception of his three daughters into the Orthodox Church in London in April 1762. 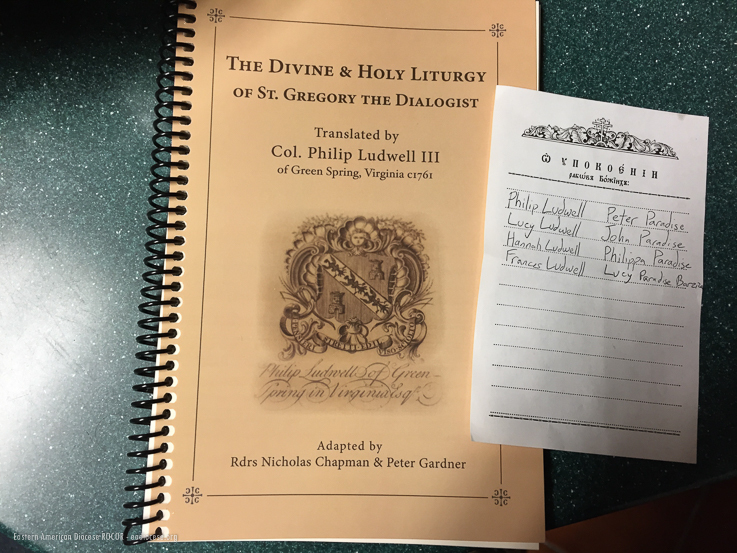 In 2014-2015, Colonel Ludwell’s translation was transcribed from the original handwritten text by Nicholas Chapman and prepared for use with a deacon by Peter Gardner, of St. Polycarp Press. It has also been updated to conform to contemporary usage, and a short historical introduction added. This edition was published in the same year by St. Polycarp Press and can be purchased here.